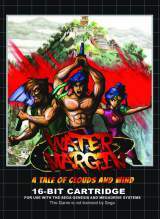 Water Margin - The Tales of Clouds and Winds © 2016 Piko Interactive. * Magic of various levels of power. * Character names, game story, cutscenes, different endings translated into English. * Appealing 16-bit graphics and music with stereo sound. The game was exclusively available only in China, Taiwan and Hong Kong markets mostly, during the late 90's. After Piko Interactive acquired full copyright of the game, it was localized and available for purchase in 2016.